Within its 6 million acres, Denali National Park contains everything you need to enjoy the trip of a lifetime. A daytrip into Denali could take you to the glaciers of Denali, four-wheeling to adventure, or paddling along the serene Nenana River. Whatever your interests, you’ll never run out of unforgettable experiences in Denali! Here are just a few of the excursions waiting for you in Alaska’s natural playground. 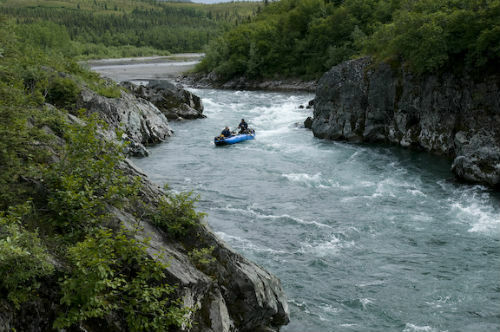 Whether you want the thrill of riding over whitewater or the chill relaxation of a jetboat safari, Denali provides a gorgeous backdrop for any river outing. Whichever you choose, you’ll experience tranquil vistas and fantastic wildlife viewing of bear, moose, caribou, and Dall sheep from your raft-side vantage point. You’ll also get to learn about area landmarks, history, and regional tales from your seasoned guide. Fly-Fishing: Whether you’re a lifelong fisherman or you’ve never picked up a rod, fly-fishing in Alaska is a must. Start out by fly-fishing for massive Arctic grayling (a freshwater salmon offshoot) in pristine Jack Creek. All gear and targeted instruction is included. Golfing: If you’re more the type to practice your swing while deep in thought, try opening your mind by golfing on Alaska’s Black Diamond course, surrounded by soaring mountains and (almost distracting) views of Otto Lake. This 9-hole course allows for singular experiences such as snagging a tee time beneath the midnight sun or witnessing a moose crossing the green. Via Bus: For unmatched vistas and wildlife viewing opportunities, a full-day Tundra Wilderness tour takes you far into Denali for photo ops of Polychrome Pass and Denali on clear days. On top of that, you can view big game such as caribou and bear through live video feeds! On Foot: Pair up with a trained naturalist as you take a relaxed walking tour of the Alaska Range. You’ll see examples of the subarctic alpine tundra and have the opportunity to climb above the tree line into true alpine territory. Along the way, your guide will introduce you to wildflower species, migratory birds, and more. Extra gear and a walking stick are provided. Drive your own four-wheel ATV and join your guide on the Black Diamond ATV Adventure & Backcountry Dining tour of the Alaska wilderness. Control your own journey and enjoy the spectacular scenery from the Dry Creek River Bed all the way up to see the entire Healy Valley. Experience Alaska as it was meant to be – rough and wild! Glacier Landings: Sounds pretty incredible already, right? A flight tour of Denali allows you to do just that from the cabin of a twin-engine airplane. Not only will you get rare views of the “Great One” at close proximity, you’ll also land on Denali glacier, where you can enjoy the indescribable sensation of standing above the clouds. Flightseeing: Circuit Denali and its summit in a multi-engine craft; soar over the impossibly steep ridges of the Alaska Range and alongside such jaw dropping sights as the 14,000 foot Wickersham Wall. Fly over Denali’s dramatic topography and get a true sense of what makes the famous national park one-of-a-kind. Iconic Alaskan huskies are a stalwart of rural living in Denali. Learn about all this and more at Husky Homestead, where an Iditarod champ opens up his home for a glimpse into the dog-racing life, as well as his own off-the-grid lifestyle. At the homestead, you’ll meet the adorable pups behind the legend, as well as see real gear and racing sleds. You can also hop aboard a dog sled for the ride of a lifetime. Channel your frontier spirit by climbing aboard a gorgeous covered wagon pulled by two sturdy draft horses for a half-day journey that will take your breath away. As you rumble along the tree-lined trail, you’ll have plenty of opportunities to revel in the views and mountain air. Arrive at a rustic pavilion surrounded by gorgeous vistas and sit down for a homemade gourmet feast. To learn more about any of these amazing Denali excursions, or to discover even more adventure possibilities, visit our excursions page. With its vibrant wildlife population, rolling tundra, glacial valleys, and immense mountain peaks, Denali truly is an adventure land — one you’ll want to enjoy from many angles!